The clouds were rolling in and darkening the skies as we arrived at Waharau late in the afternoon. Much discussion was entered into about where we were going to park, anyone would have thought that a) we had never been here before and/or b) there were lots of people here. Neither of which are true. We settled into the corner – we haven’t actually parked in this particular location before – and just as we had finished putting out the awning, the rain started. It did not let up until late Friday night and wow, did it ever rain, it was consistent and torrential all day on Friday but it did start to diminish Friday night with Saturday dawning a gloriously fine day. We have been to Waharau many times before and have extolled its virtues to many, however, unless we are here with friends, it is very rarely that we find ourselves with any company. Not that we mind, in fact we love it and long may it last. Of course I made the most of having both power and hot water with the washing machine getting a good work out. As well, we have been making chutneys and relishes again, it is handy to have a prep bench to work on, I can cook up the pickles on our portable gas cooker so that the cooking aromas are not filling the van. We had a few days by ourselves before Bill & Estelle arrived for a couple of nights. Roy & Bill set the net in the hope of some nice flounder, no flounder but they did come back with 16 good sized Kahawai. They were shared between us, we smoked all ours and I made it into smoked fish pies, smoked fish pate, a lovely salad of smoked kahawai, fennel and pear. The remainder was frozen. Now we hope to get some flounder as some of us are heartily sick of smoked fish! Bill & Estelle had only just left (as in 20mins had elapsed) when Jim & Judy arrived. Roy & Jim did go fishing and set the net but no flounder was harmed in this process, instead they came back with 8 Kahawai. 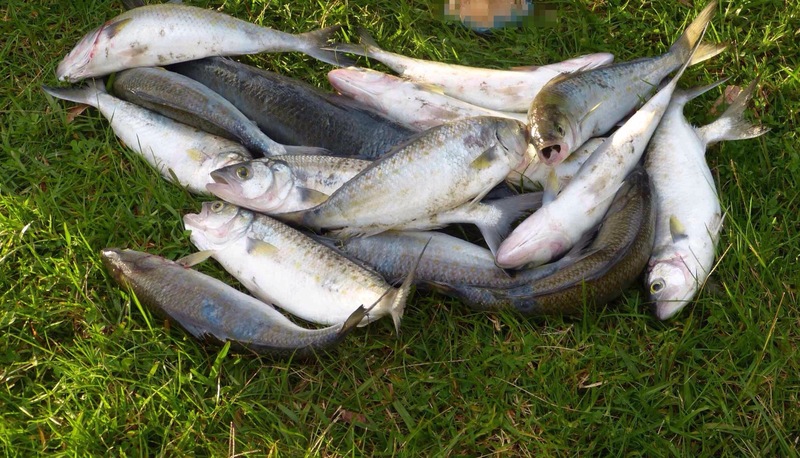 This time we gave most of the kahawai to Jim as we had more than enough, instead we turned our portion into bait! We had a couple of days of torrential rain and although we were snug warm and dry, some parts of the country did not fare so well and were flooded. 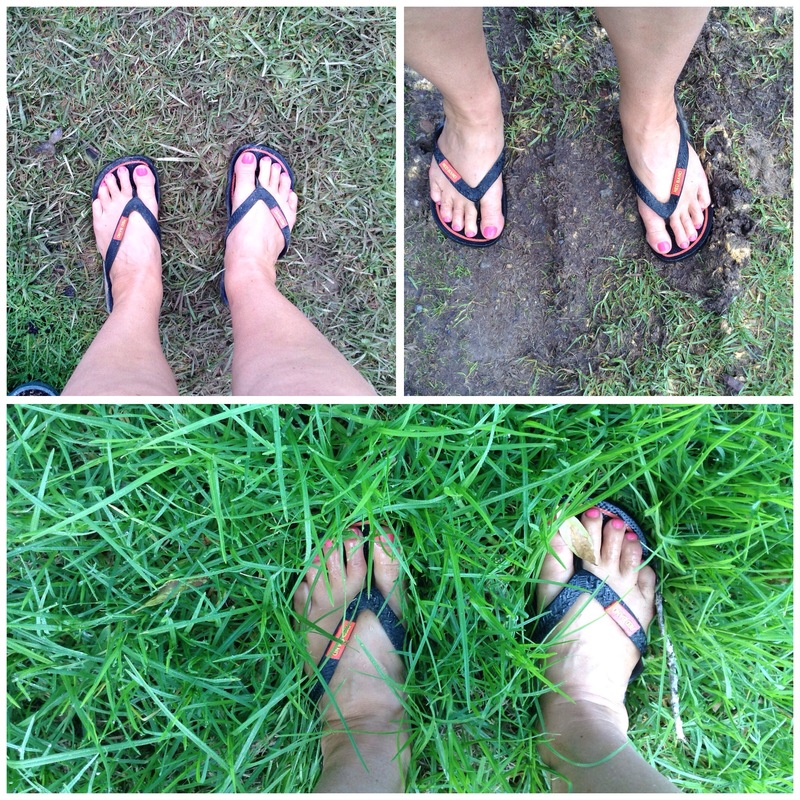 However, I do have to admit my red bands did not afford me dry feet in all the mud!! Red Bands are a Kiwi Icon, they are a brand of gumboot aka Wellington boots for those of you in the northern hemisphere. Traditionally gumboots have always come up to just below the knee. However in 1958 staff at Marathon Rubber Footwear – the forerunner to Skellerup – decided to create a shorter boot and on 21st October the first pair of Red Band gumboots rolled off the production line and became an instant hit around the country. 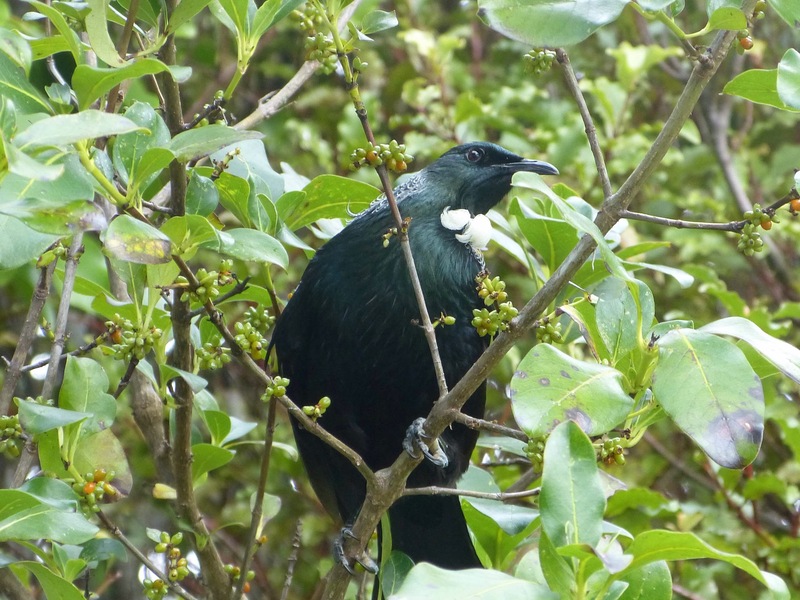 We were well entertained by the bird life at Waharau, there was the Tui that came every day to dance around the trees getting the last of the berries and entertaining us with its birdsong. It definitely wasn’t shy and quite happily sat in the tree just a few feet away from us. 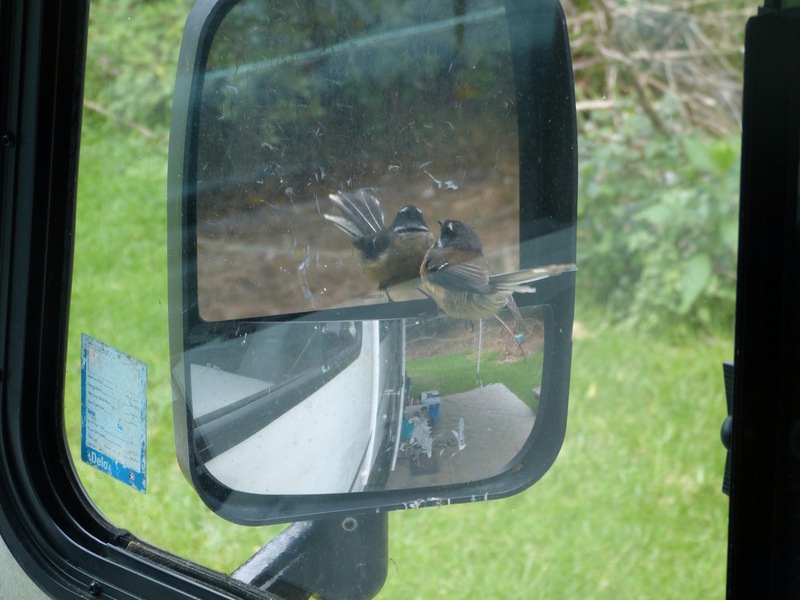 Then there was the Fantatil (Piwakawaka) who decided that we had a very friendly fantail in one of the wing mirrors. It came visiting daily and spent hours dancing, prancing and pecking away at its reflection in the mirror, wondering why it’s amorous advances were not reciprocated. The mirror required a good clean by the time we were ready to leave. Soon enough our time at Waharau was up and it was time to move on. 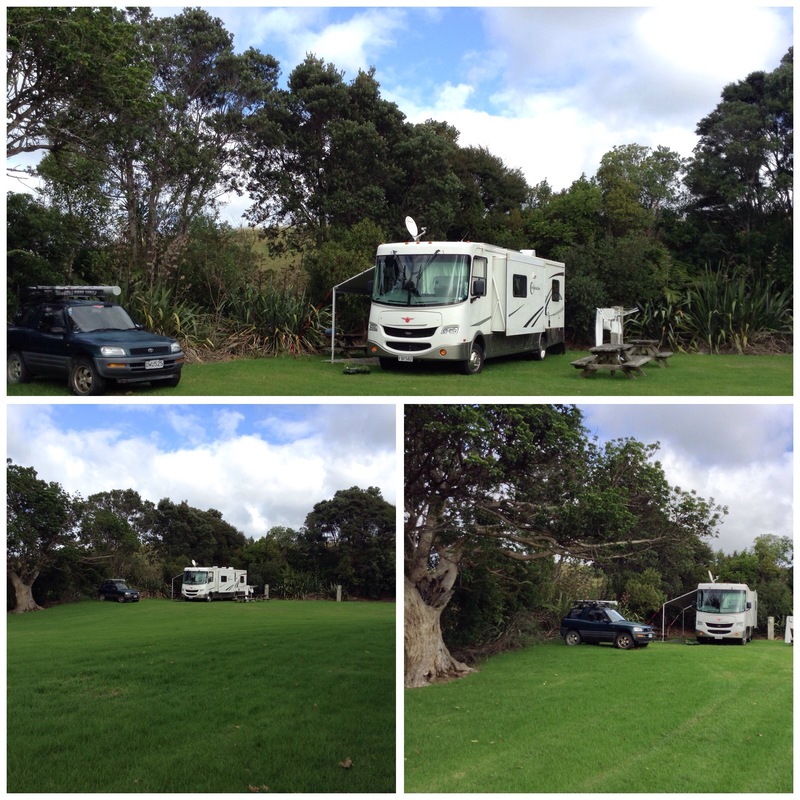 We had planned to go just down the road to the Kaiaua Boat Club, however, the ground there was so wet and boggy that most of the available parking area had been roped off, so plan B was instigated and we meandered further down the road to Ray’s Rest, a very popular spot for motorhomes to park. 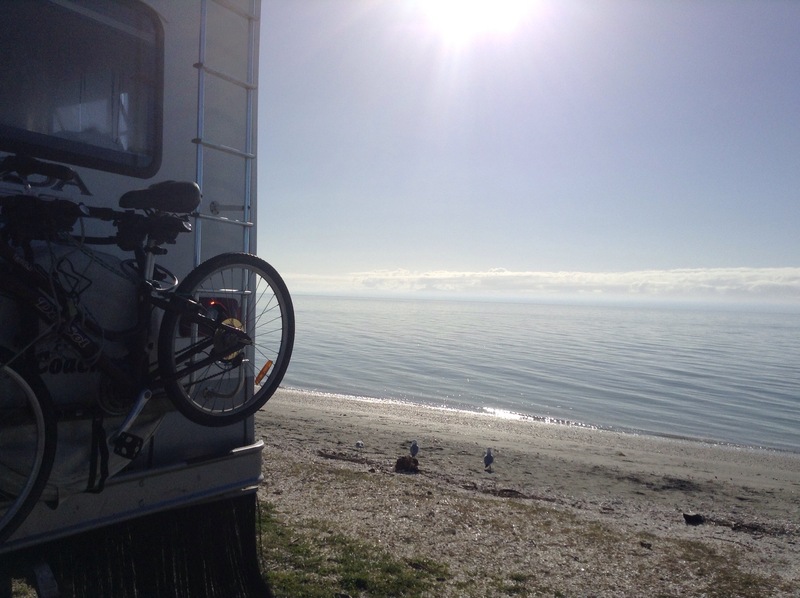 Where else can you safely park this close to the sea? 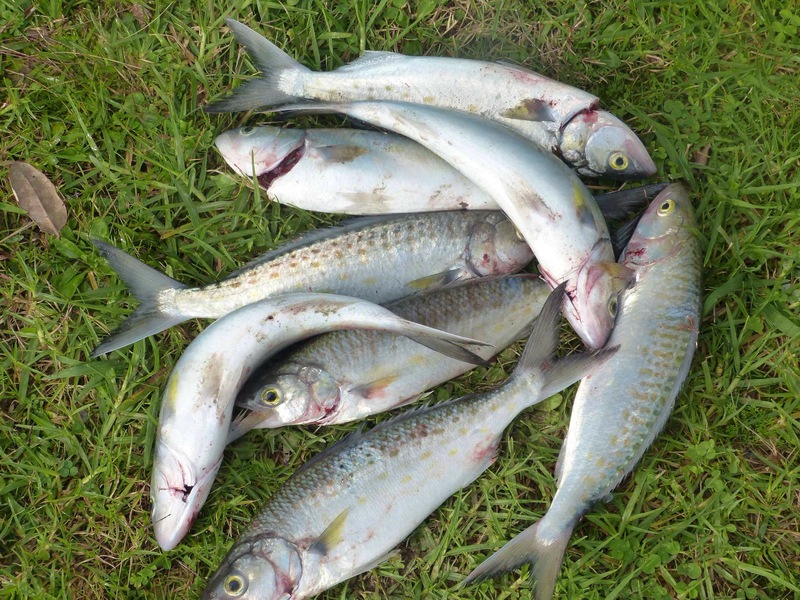 The wind was favourable enough to allow Roy & Jim to put out their kites and set out a long line which resulted in a much more successful haul with 4 good sized snapper and 4 kahawai on the first evenings catch. The following day only one more snapper was added to the tally and all of our share of the snapper was cooked and eaten fresh. And oh my goodness, it was delicious, there is nothing like freshly caught and cooked fish. There is a two day parking limit at Rays Rest so Wednesday morning we packed up, said our farewells and headed off in opposite directions. We were not sure where we were heading to but quickly decided to go to Anzac Bay, Bowentown which is not too far from Tauranga. We have not been here before and so we were pleasantly surprised to find a lovely grassy parking area reserved for motorhomes, with a three night limit. And why are we heading back in the Bay of Plenty? Because we are eventually ending up at John & Jude’s in Whakatane as they have asked us to housesit for them for a week whilst they are off celebrating John’s admission into the realm of the advanced years, old farts, gold card carrying pensioner club! 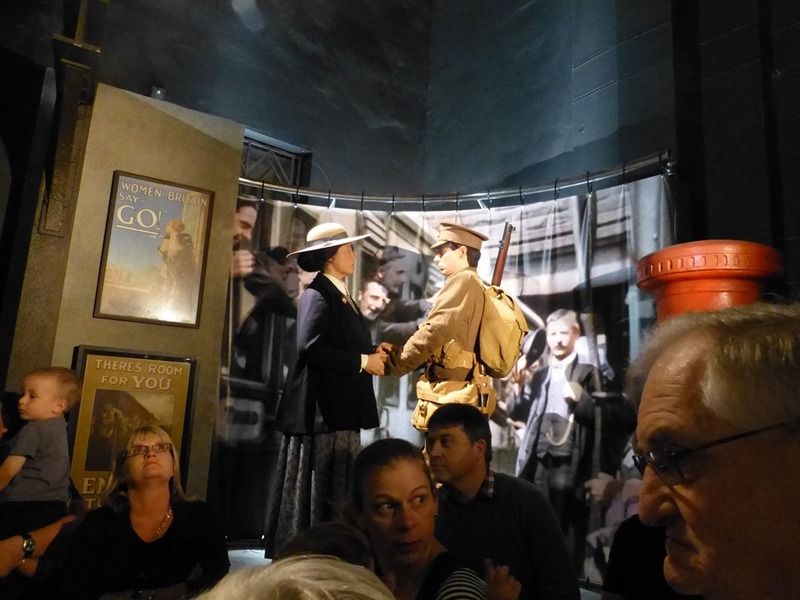 When we went to Wellington two weeks ago a major objective to see both of the World War 1 exhibitions. 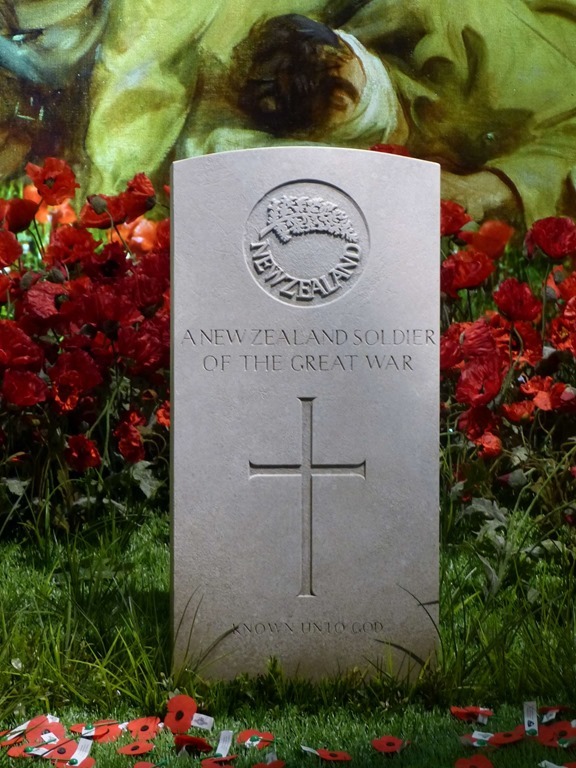 Rich in personal stories and highly evocative of the times, The Great War Exhibition highlights the activities, challenges and sacrifice that was made by New Zealanders on the First World War battlefields and also at home in wartime New Zealand. 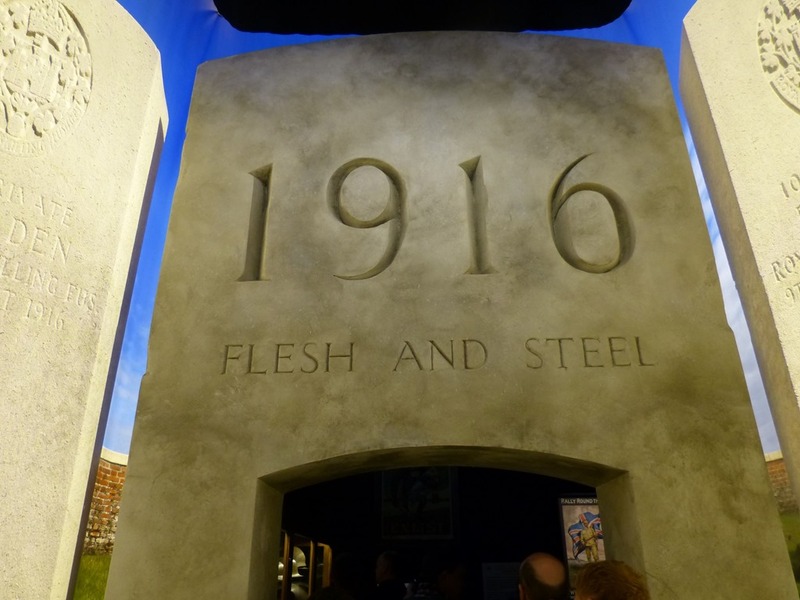 The exhibition was developed by Sir Peter Jackson and his team at Wingnut Films assisted by Sir Richard Taylor and Weta. 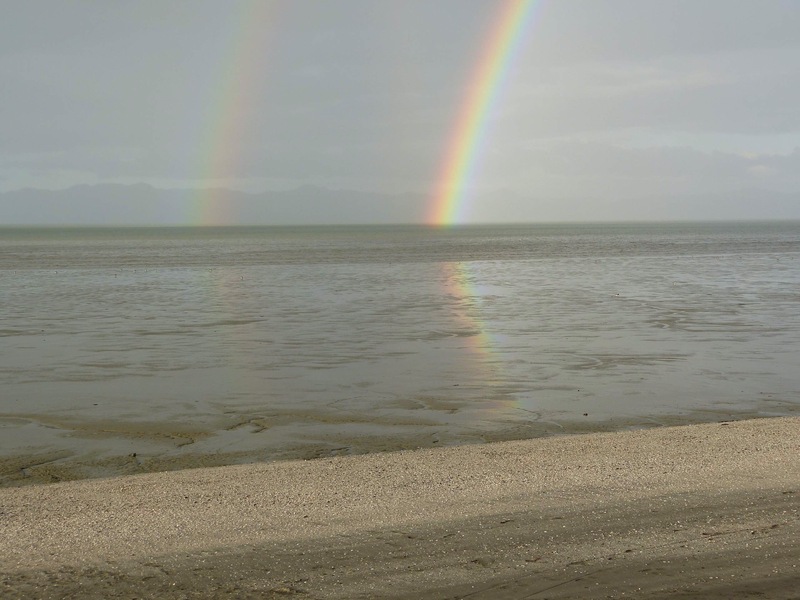 It offers a unique opportunity for visitors to see and feel a special part of New Zealand history. 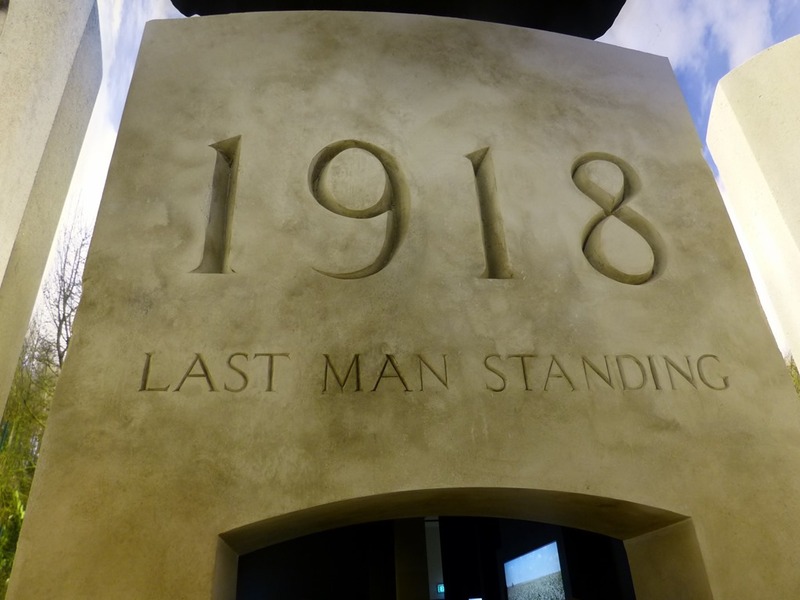 Experience the triumphs and tragedies of Gallipoli through the eyes and words of the ordinary New Zealanders who were there. 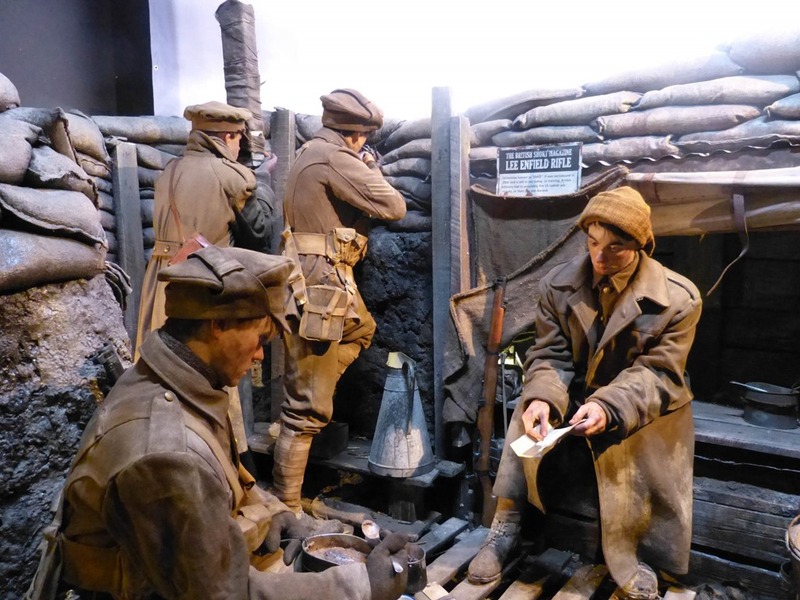 The worlds of movies, model making, and museums combine to take you on an immersive journey through the battlefields. 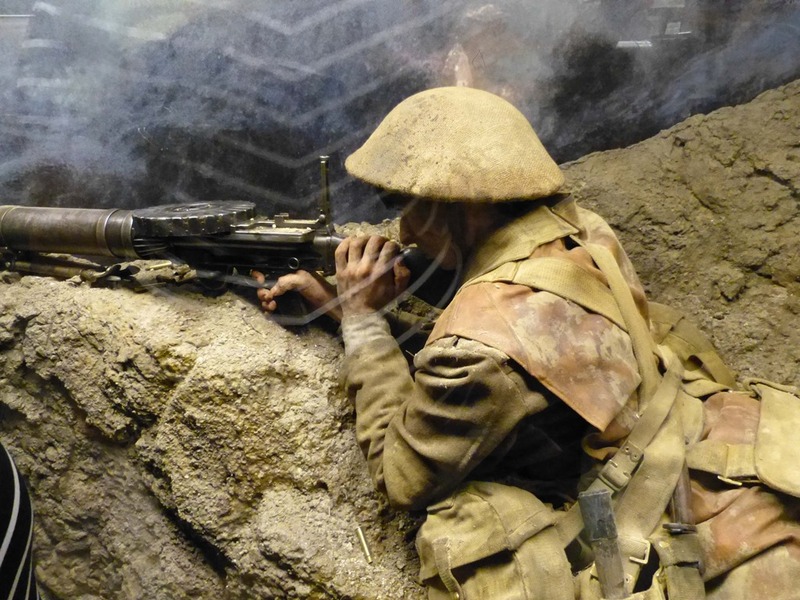 Developed by Te Papa working closely with Weta Workshop, Gallipoli: The scale of our War promises to be a highly emotional experience and a fitting tribute to those that served and those that lost their lives. Both proved to be immensely interesting, emotional, and thought provoking. I have written on both in separate blog entries as they are different in the way they have approached their subject. 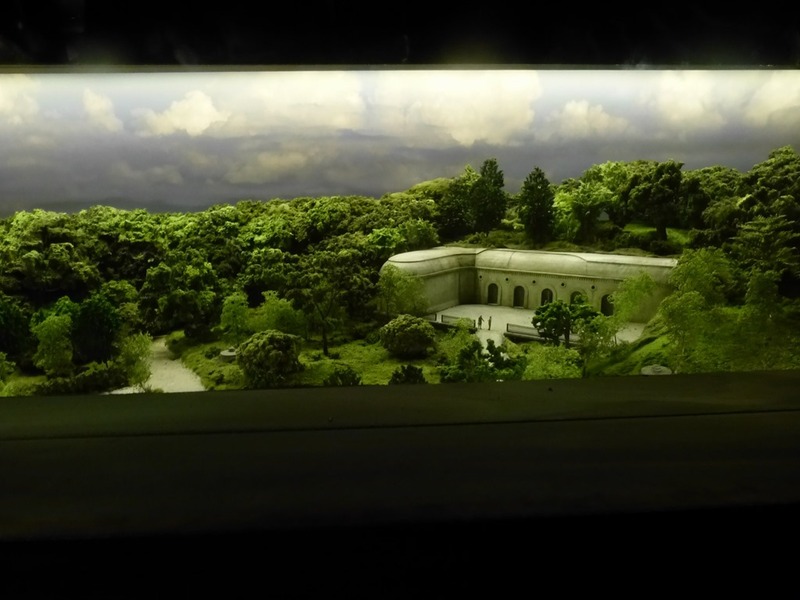 So here is a view of The Great War Exhibition, from our perspective. 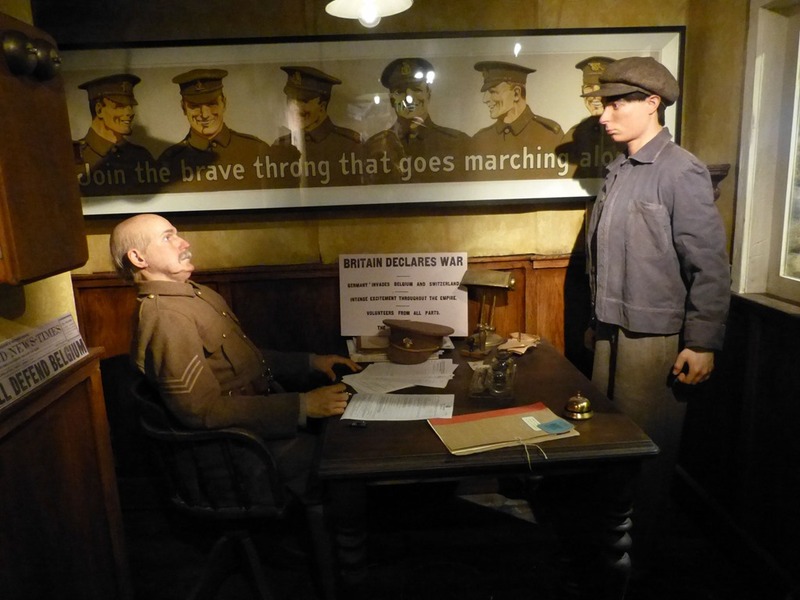 The exposition is a mixture of tableaux with a main character followed through from his enlistment to his discharge. Here is the young man enlisting at the beginning of the war. 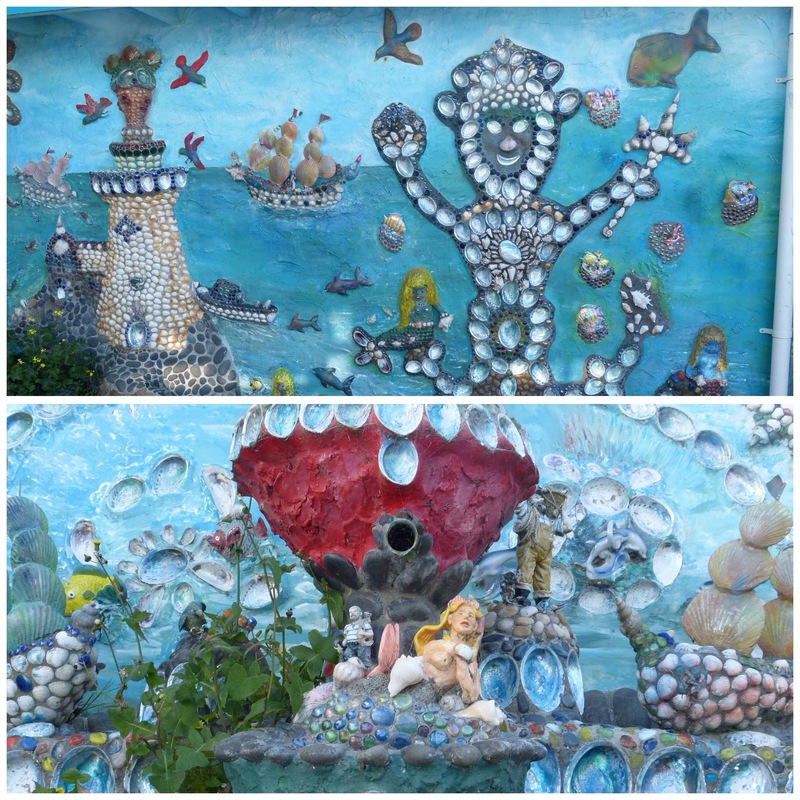 At each stage there are a combination of illustrative panels, artefacts, visual, audio and written memoir and explanations as well as some olfactory displays. Some are by the participants themselves, others from commentators, papers and collectors. Bellow is a typical mixed grouping showing a team of horses towing a gun into position with a plane mounted above and a roadway below with a double decker bus transporting troops to the front. The displays are in chronological order with each year entered by an archway with an inscription pertaining to the period. These archways are very reminiscent of entrances to the cemeteries in France and Belgium. 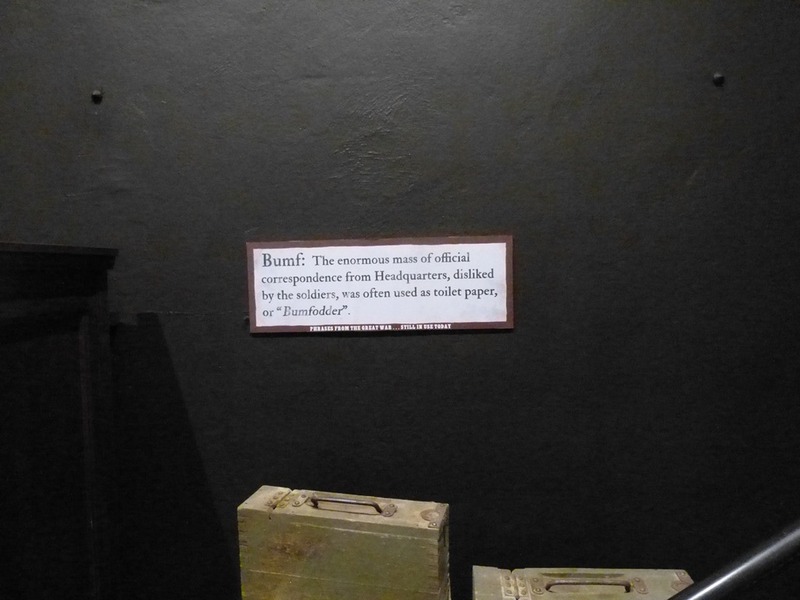 There are a number of interactive scenarios where one can see what the soldier of the day was seeing or doing. 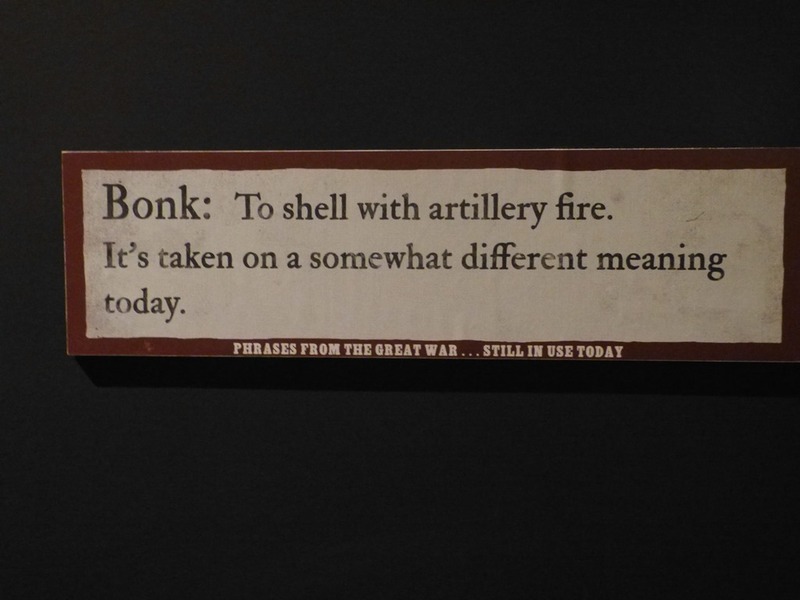 Throughout there are definition boards showing words or expressions used during the war with the definition of the word. The two pictures below show the same location before and after the battle that took place in the location. This goes some way to illustrating the utter destruction wrought on the country over which the major battles were fought. 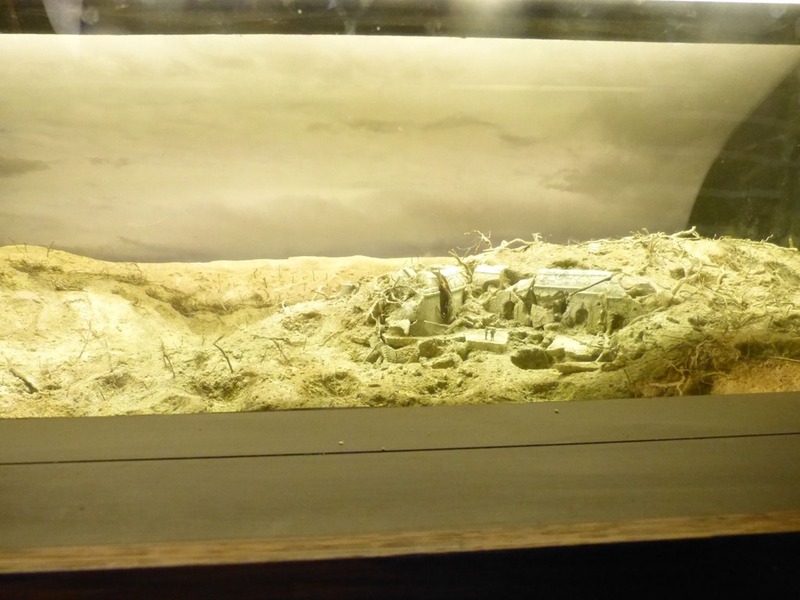 There are also dioramas illustrating specific terrain. 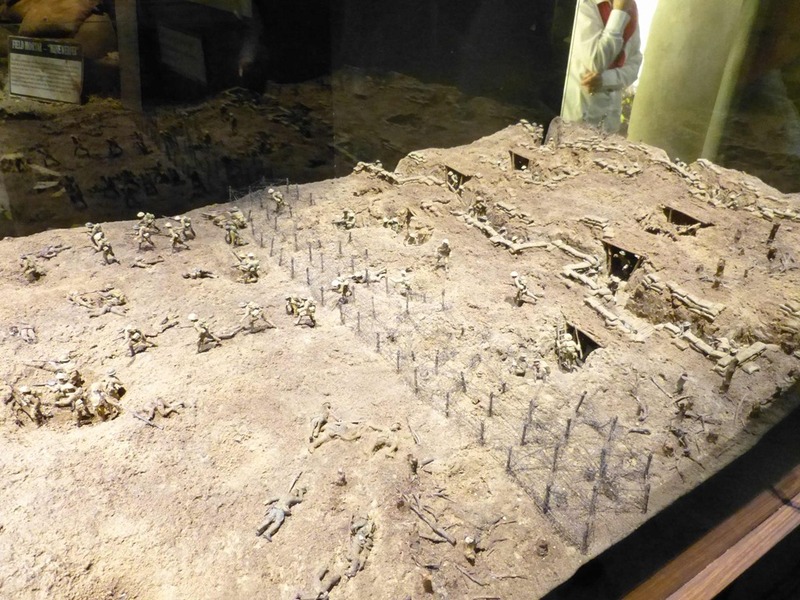 This one shows a model of the Western Front trench lines including in the second picture, taken on the side of the model, showing the underground warfare being waged. 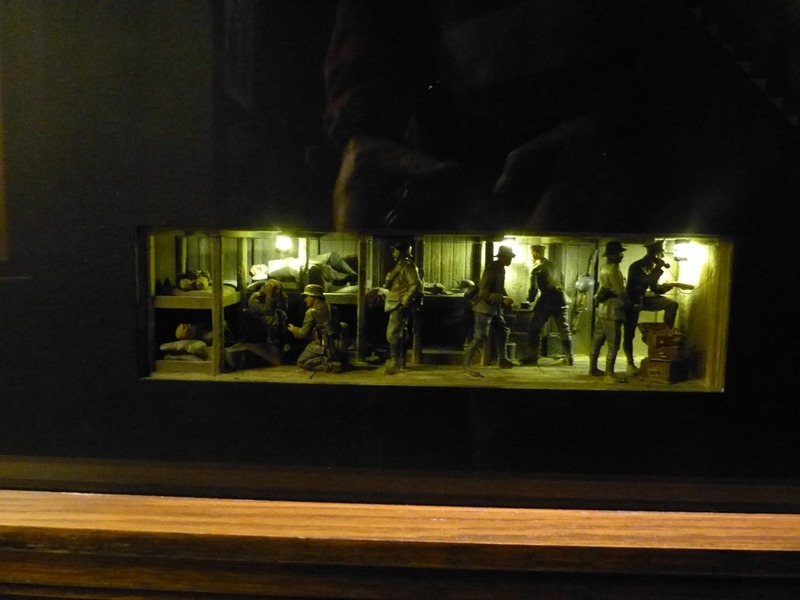 A typical model (life size) seen throughout the exhibit. 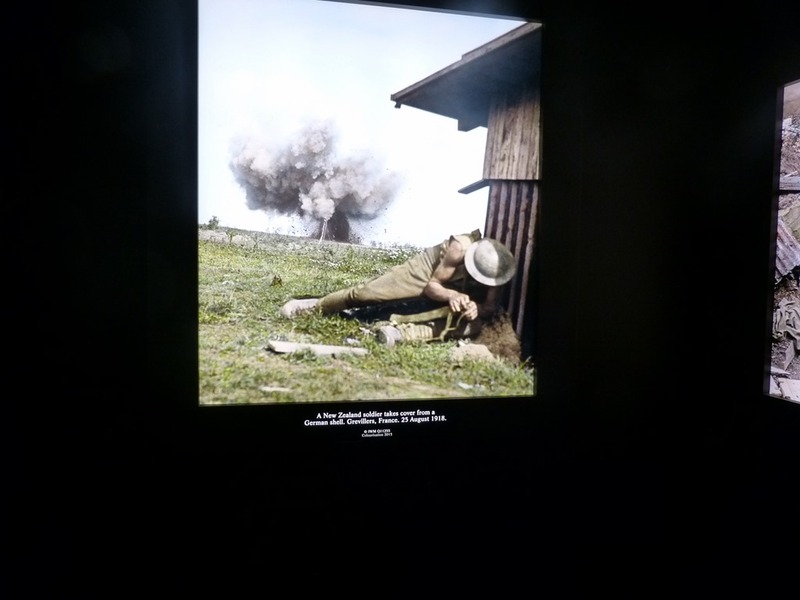 There are a number of colourised black and white photographs at various points throughout the exhibit. The one immediately below is a photo which iconic and is often used to illustrate the conditions during the winter months on the Front. 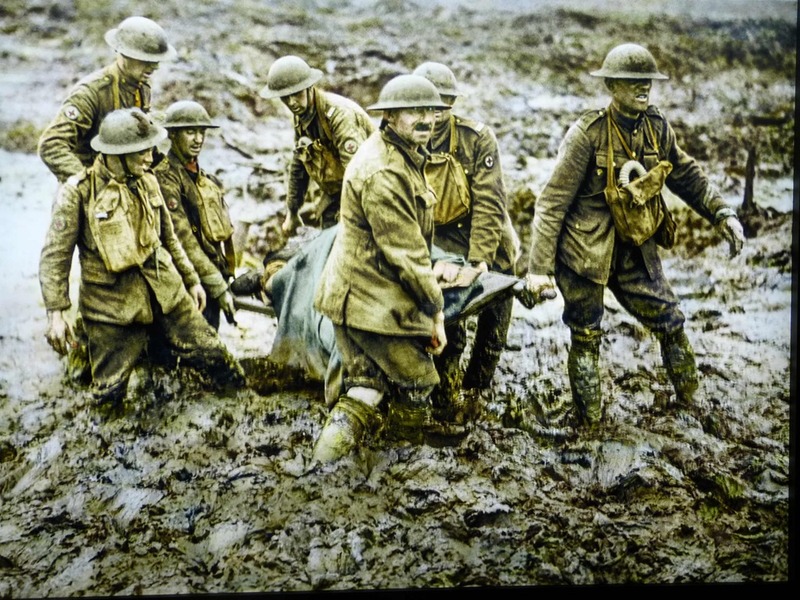 These photos take on a much more immediate impact for having been coloured. The one below is of particular interest as it is taken on the day my father Roy was wounded. He was with the New Zealand forces attempting to take Abraham Heights, adjacent to Broodeseinde where the photo was taken. 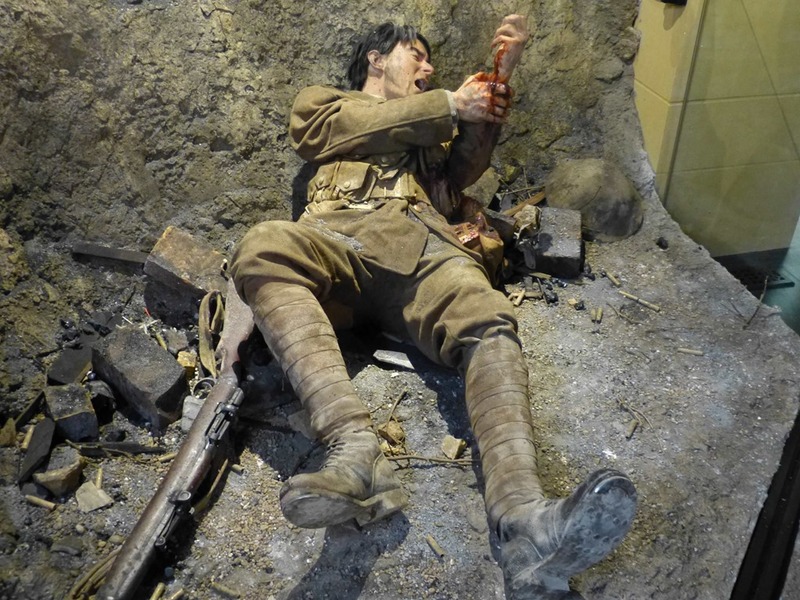 He received shrapnel wounds to his right knee and face on the 4th of October 1917. He was invalided back to Hornchurch, England and subsequently was invalided out and left for New Zealand in December 1917. The final time we see the young man, whom we saw enlisting, is him lying wounded. 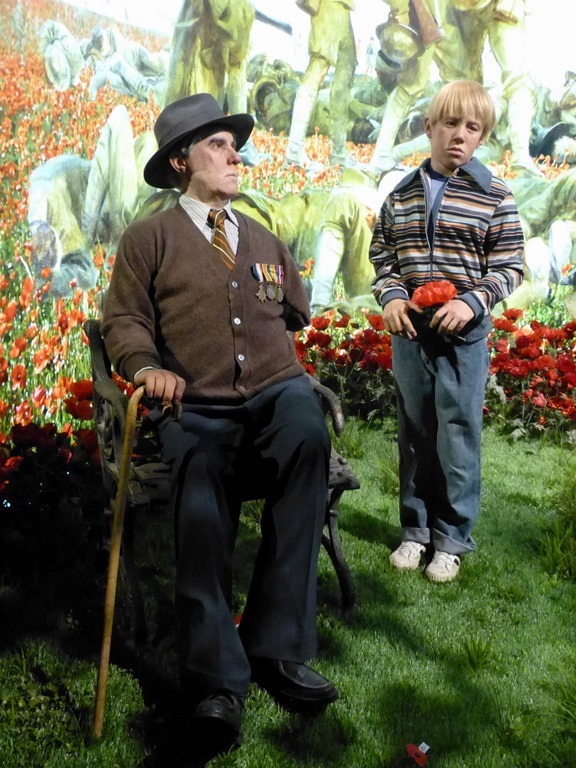 But at the end of the exhibit here he is in his garden with his grandson, one of the fortunate who survived what must have been a shocking experience for the young men who went to the farthest point from home to such an horrific experience. All in all a very moving exhibition which we can highly recommend a visit. The exhibition is evolving with another section due to open in August this year. This will be The Trench Experience where the challenging environment men lived and fought in for many months will be experienced through sights sounds and scents. 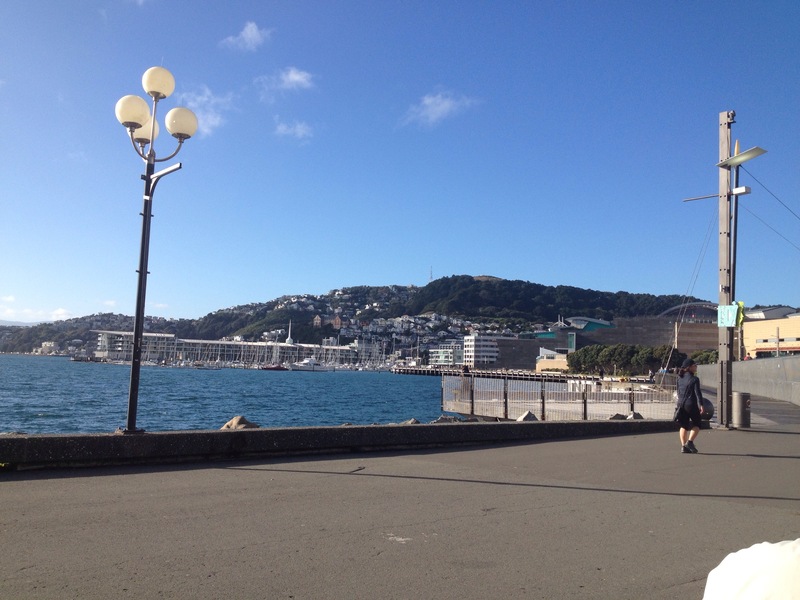 We’ve just had a couple of days in Wellington, we flew down on Saturday night and were back in Auckland by Monday evening so it was definitely a quick trip. 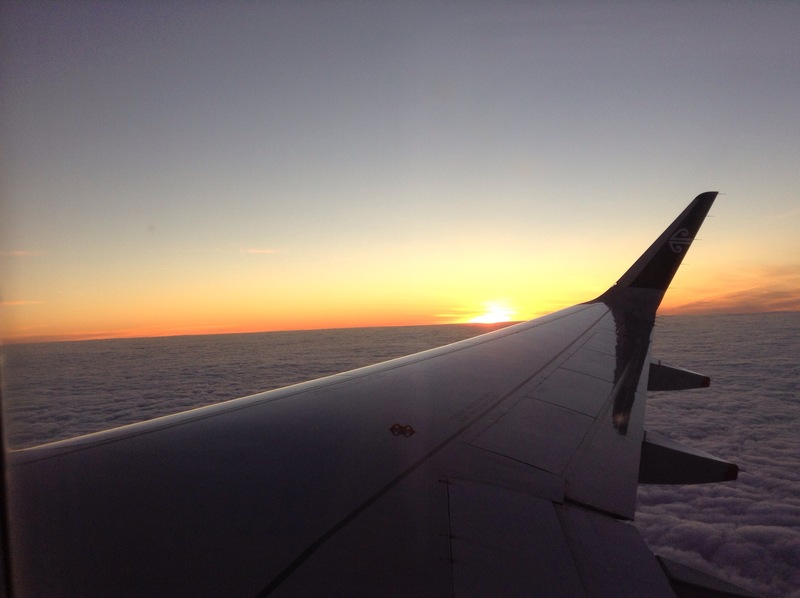 The sun was setting on the large cloud bank as we flew down on Saturday evening making for a very pleasant view. 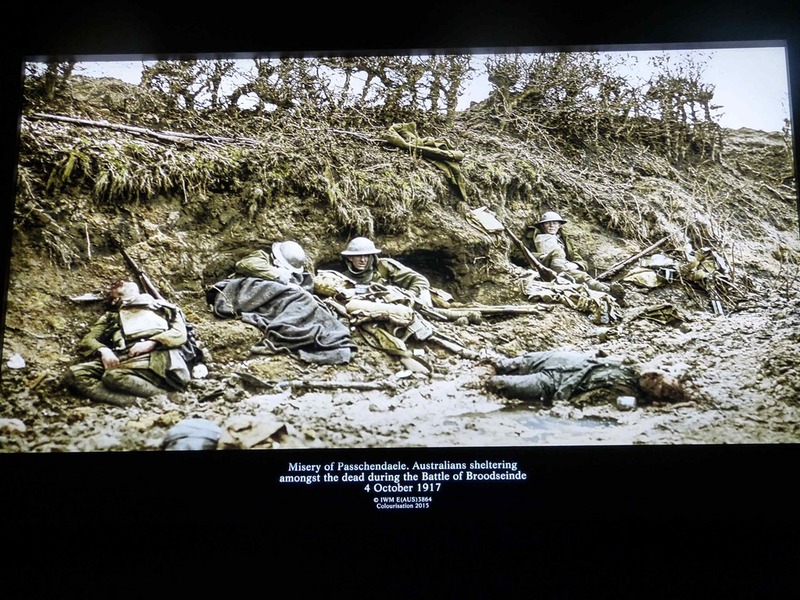 We went to Wellington to see the two World War One Exbititions; the Weta Workshop Gallipoli exhibition at Te Papa and the Peter Jackson Great War exhibition at the Pukeahu National War Memorial Park. They were both amazingly breathtaking and are worthy of their own separate posts, which we shall report on shortly. 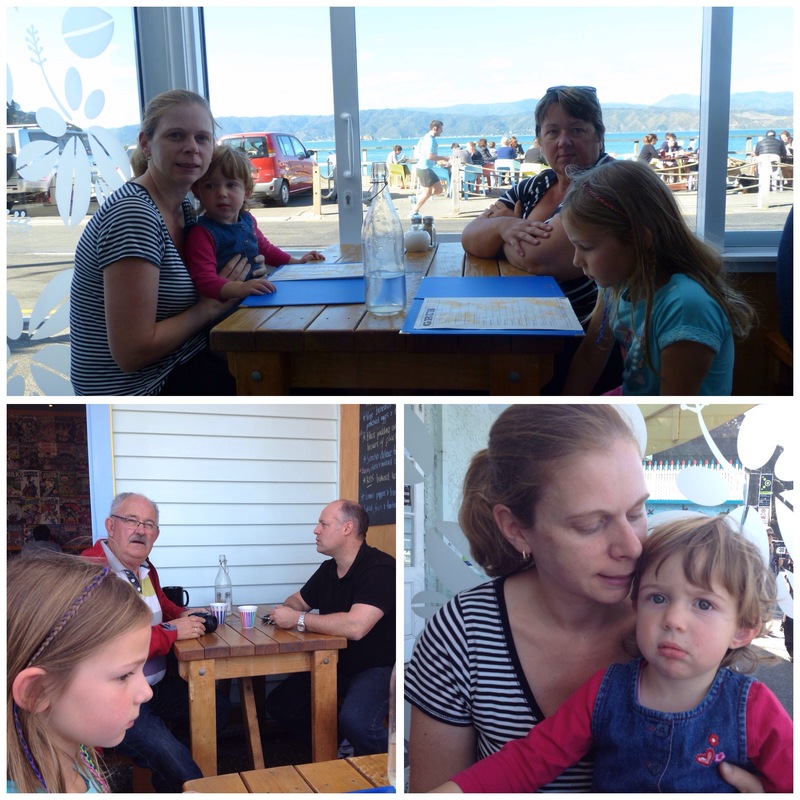 Whilst in Wellington we took the opportunity to meet up with my niece Natalie and her husband Richard and their two delightful wee girls Renee (nearly 7) and Michelle (nearly 2). 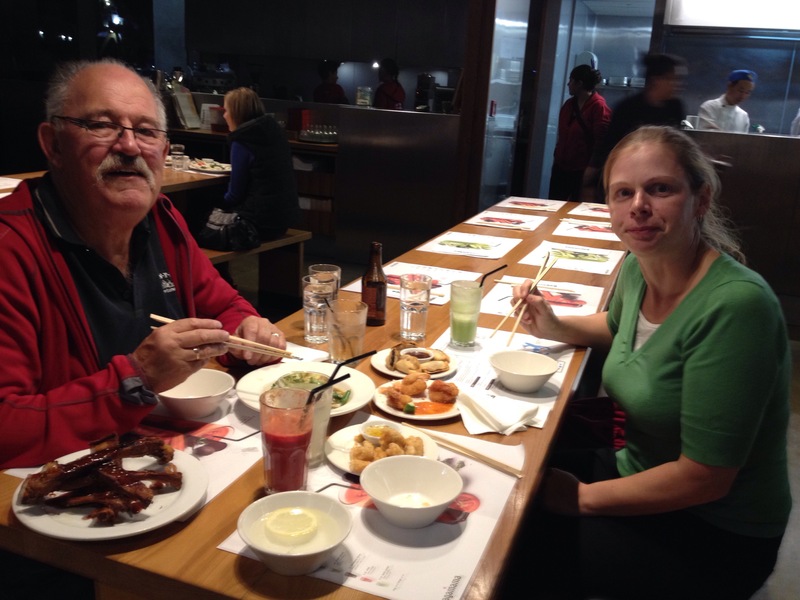 Natalie met us on Saturday night for a late dinner in town at Wagamama on the waterfront. Sunday morning we walked down to the waterfront for a quick breakfast. Wellington turned on a stunning day for us and it was very pleasant sitting out in the morning sun watching the world go by. We met up with Natalie and family at the War Memorial for a guided tour through the exhibition before heading off to Scorching Bay for a late lunch. 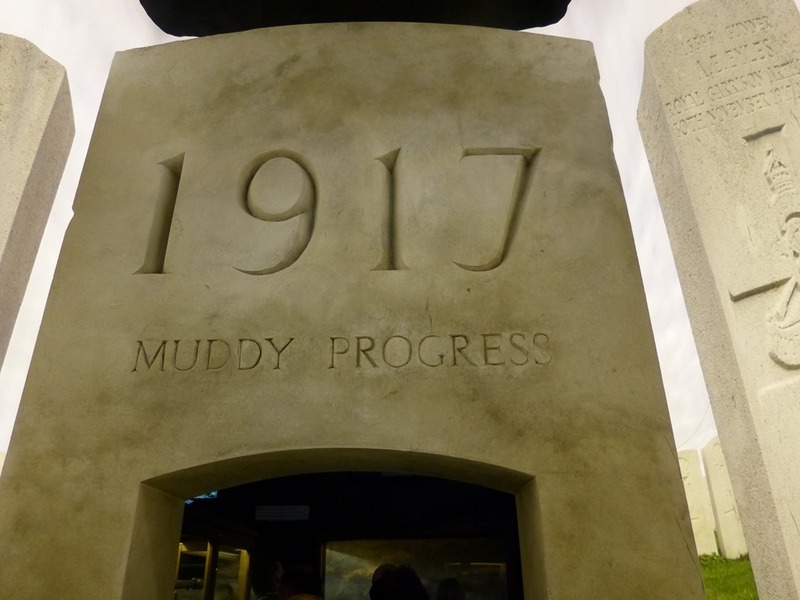 It was then back into town to Te Papa to see the Gallipoli exhibition, but the queues were still very long with a minimum 45 minute wait before we could get in, so instead we headed off to view the Air New Zealand 75th anniversary exhibition. This brought back lots of memories of trips taken when flying was a novelty and a luxury. Do you remember getting dressed up to take your flight? And being offered a menu? When seats were large and comfortable with room to move? We certainly enjoyed the exhibition and viewing all the displays. 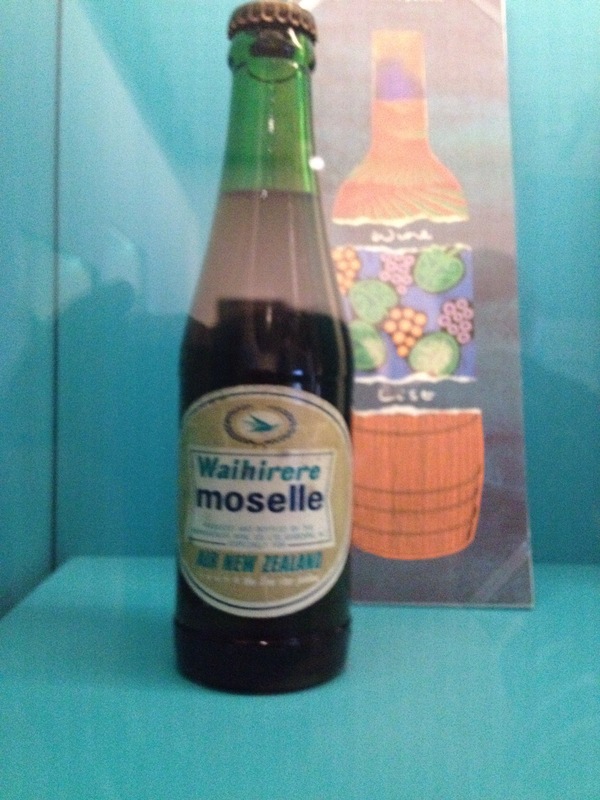 Who could forget Waihirere wines? 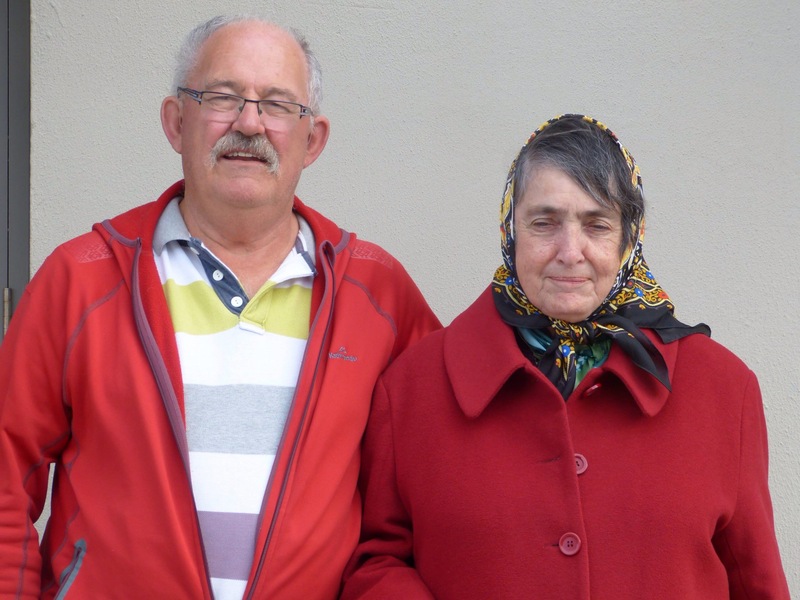 – the Sauterne was Mum & Dad’s tipple of choice! Soon it was time for Natalie to get the girls home for their evening meal, bath and bed. We bade farewell to them, and look forward to seeing them all again soon. 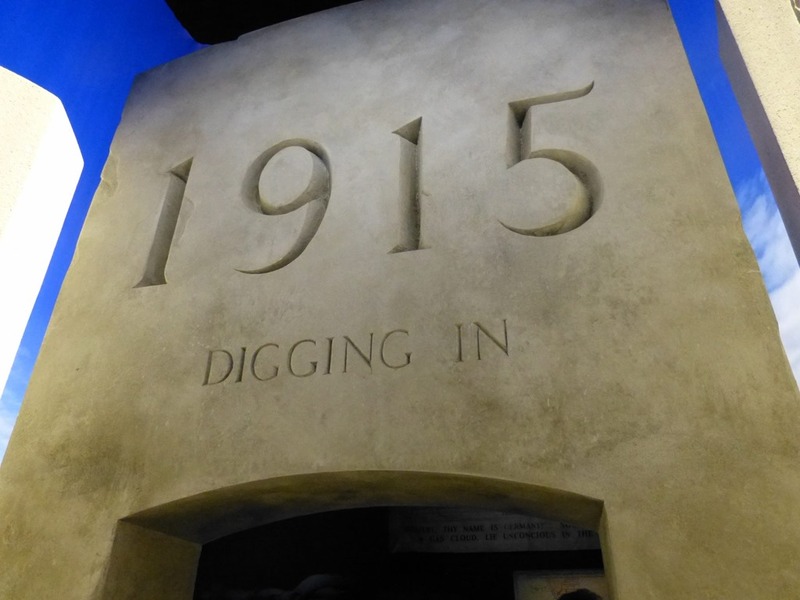 Meanwhile Roy and I headed off to see the Gallipoli exhibition, on our flight down we sat with one of the museum curators and she gave us a bit of helpful advice – that the best time to see the exhibition was after 4pm as the crowds tend to dissipate by then. We walked straight in and had a good couple of hours exploring this amazing display before heading off for a bite to eat. We headed for a well known Wellington institution for our early dinner – The Green Parrot. The food is totally unpretentious and so old fashioned that it is probably back in fashion again. 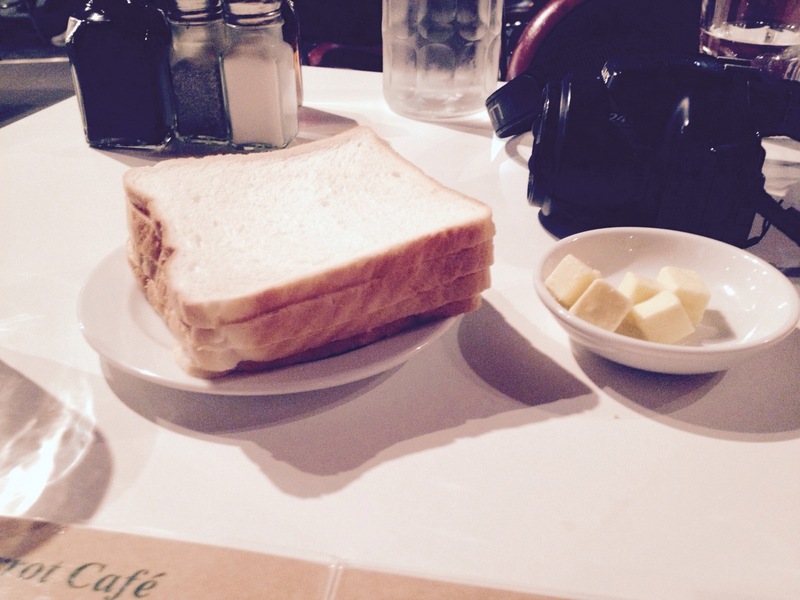 I mean, where else do you get a plate of thin sliced white bread with butter delivered to your table on your arrival?! This restaurant has been around since 1926, and is a hit with politicians and movie stars with the walls covered with pictures of famous guests. The back wall has a large painting/mural of an internal scene of the restaurant with a variety of famous faces from past and present included. The meals are renown for being large and generous, as we had had a good lunch we both chose an entree sized portion for our evening meal and even then we struggled to finish our meal. 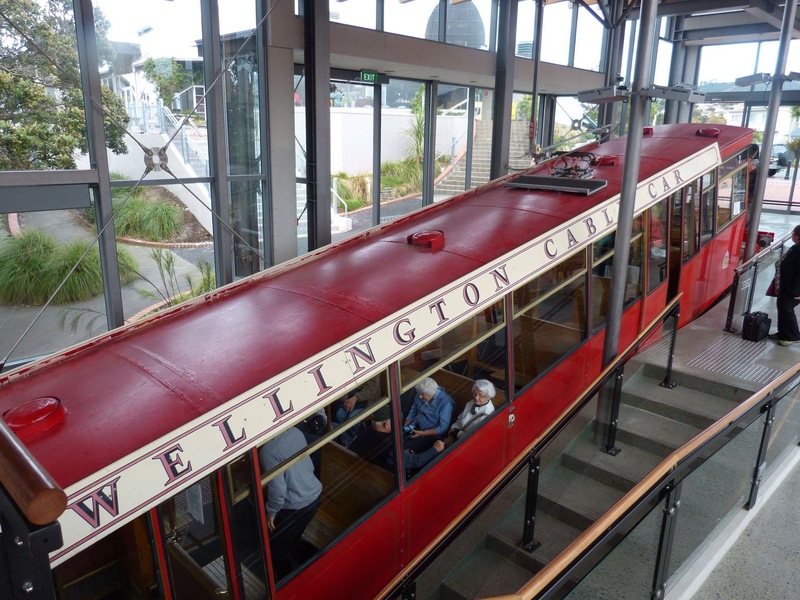 Wellingtons cable car (which is actually a funicular) – you can google the differences. Then it was back to Te Papa for a second viewing of the exhibition. Although we got to the museum at opening time, the queues we even longer than Sunday so instead we headed to the top floor and worked our way down all the floors looking at the different exhibitions. At Iunch time we had arranged to meet up with Natalie again, and also Roy’s cousin Dr Antonia Davin as it had been a couple of years since we had seen her. 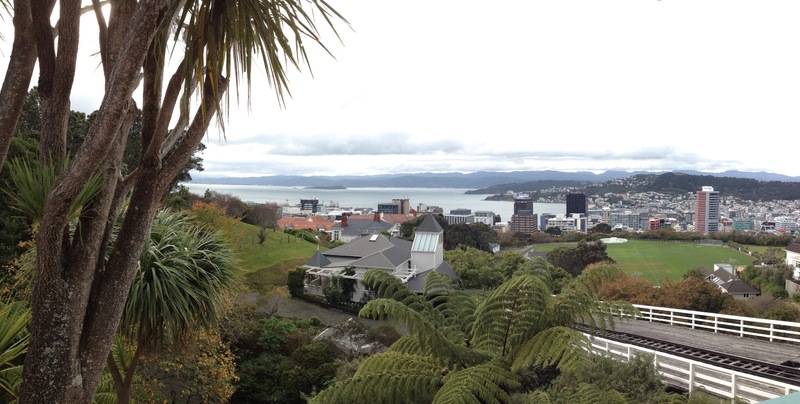 We all had a lovely lunch at St. John’s, a short walk from Te Papa and managed to catch up with all their latest news. Antonia has led a very interesting and varied life, her father (brother of Dan Davin the author) was in the Diplomatic Services, Antonia’s early life and education was very international having attended schools throughout NZ, as well as in London, Paris, New York, Rome and Canberra, she then went on to complete her degrees in France and Belgium. Her working life was just as interesting and varied and it is always fun listening to her tales. After an entertaining long lunch, it was farewell to Natalie and to Antonia, till next time. 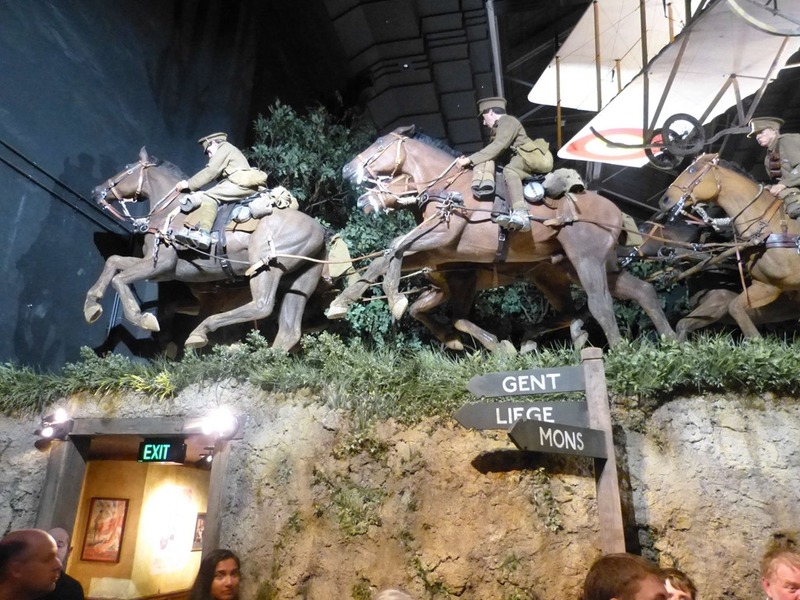 Roy and I went back to Te Papa and as luck would have it, the queue for the War exhibition had again dispersed so we took advantage of the lack of crowds and went back through the displays, this time picking up much more information and detail. Soon it was time for us to head off to the airport for the flight back to Auckland and to our van parked at the NZMCA park at Ardmore Airport. 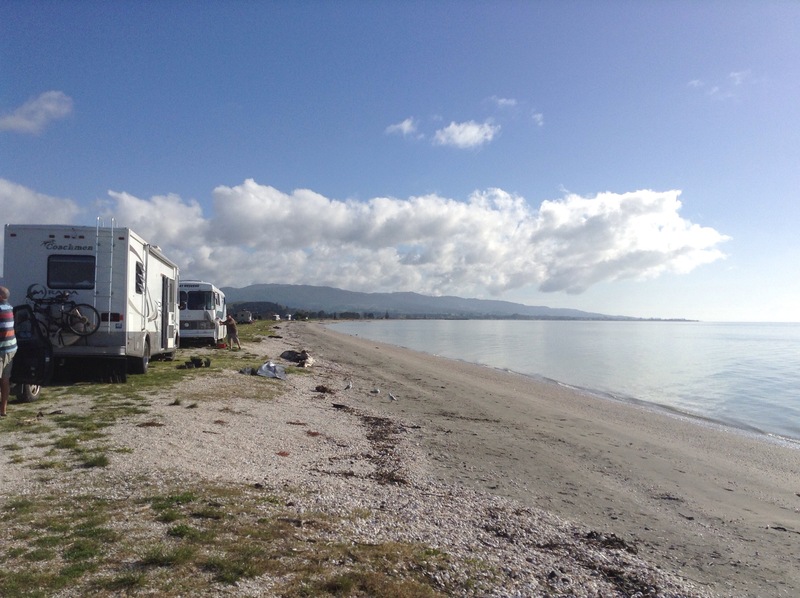 We will stay there for a couple more days to catch up with Antony as well as restock the larder and get a few chores done before we go to Waharau on the Firth of Thames for a week or two. 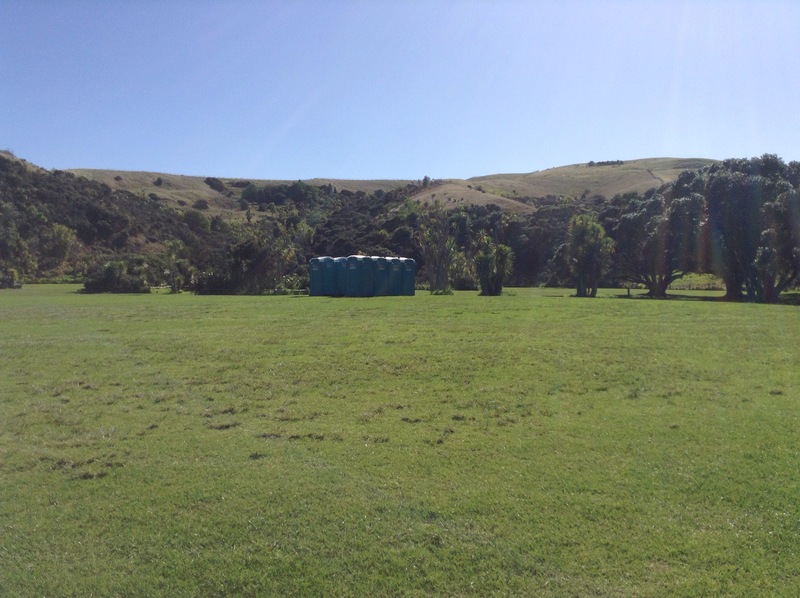 Anzac weekend was upon us, Friday morning amongst the usual comings and goings in the camp a large truck turned up with a dozen or so porta loos on the back of it which they then proceeded to unload and place in the centre of the camp. Hmmm, must be something on this weekend, perhaps we had better ask the Rangers what is happening. 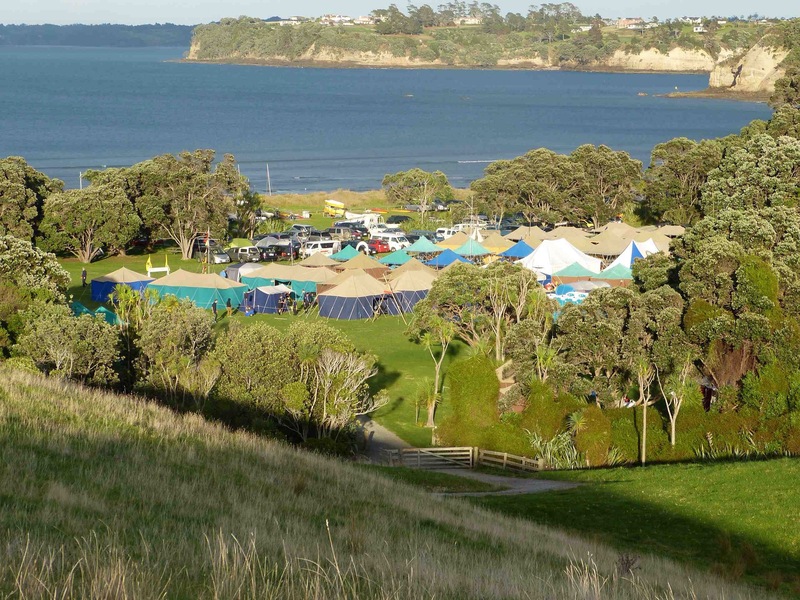 Not a lot really, just 400 or so Sea Scouts arriving tomorrow for a weekend camp!! We asked if we should remove ourselves from the camp ground, no, we were assured that would not be necessary. However, after a bit of discussion Roy and I decided that it may well be better if we moved from the camp ground so they had full use of all areas without us getting in their way. 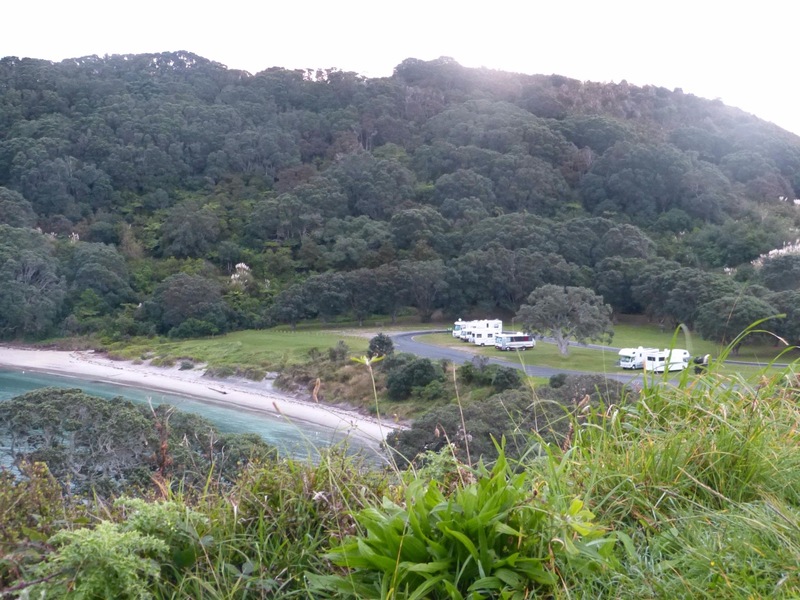 We packed ourselves up and high tailed it out of the camp to reposition ourselves all of 500m away in the designated Motorhome Parking area. 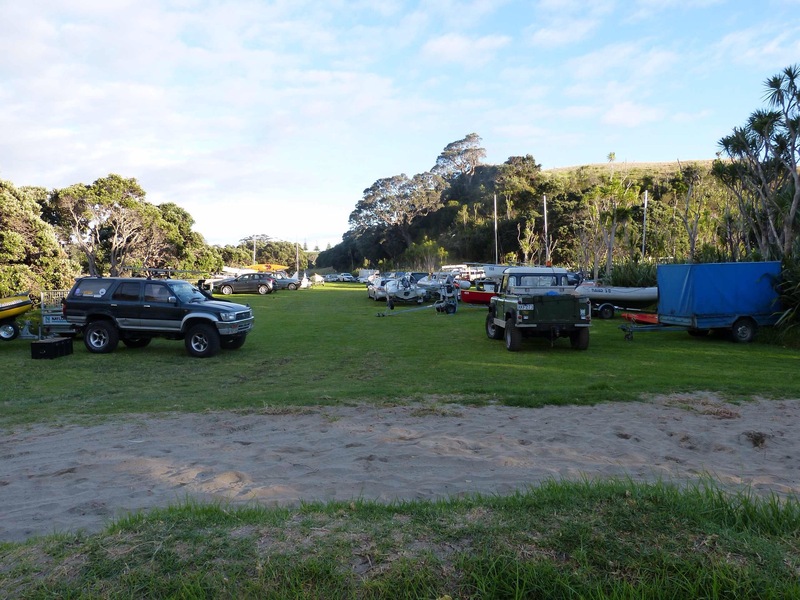 After dawn service on Saturday morning, we noticed a steady stream of traffic passing us by and by the afternoon it was a continuous stream of cars, trailers and trucks heading in and out of the camp. They were highly organised (of course) and it was not long before they were well set up. And just as well we did move, it was tent city as they covered every bit of the camp ground with the different groups set up in their allocated areas. 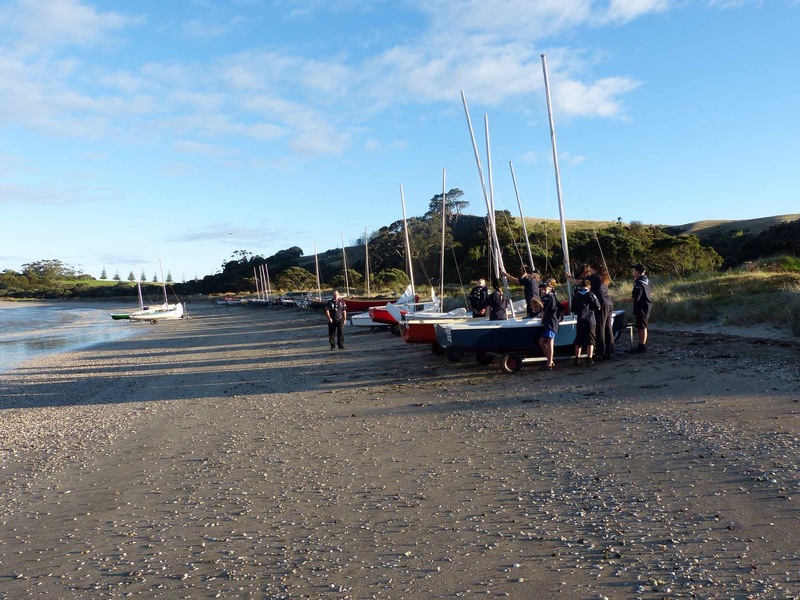 The beach had a long line up of boats of all descriptions parked on the sands. They were mainly sailing vessels for the scouts with plenty of support/emergency craft for the adult supervisors. All in all a very successful weekend, although we did feel for them as Monday mornings activities were cancelled due to the terrible weather. They then had the onerous task of packing up heavy, soaked canvas tents plus all the sundry equipment in the horrendous rain and wind that prevailed until mid afternoon on Monday. 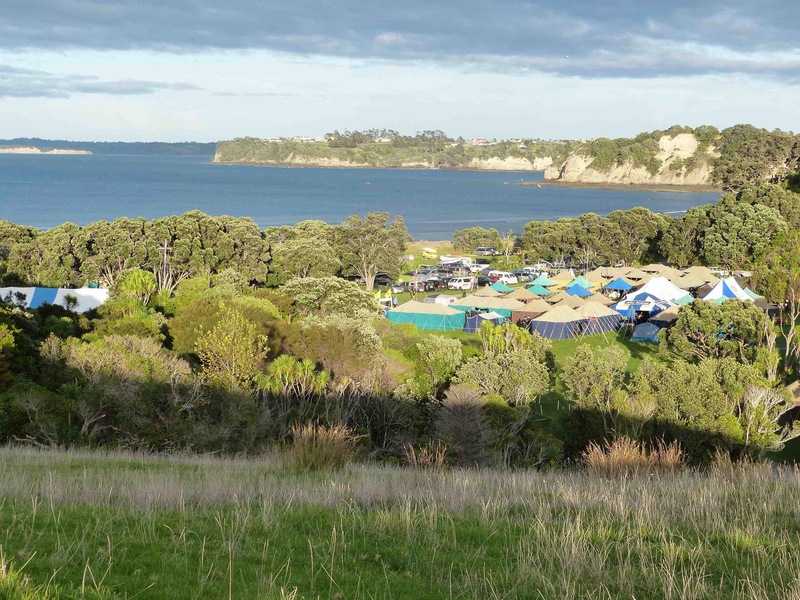 Although the weather cleared and the camp ground emptied we remained in the Self Contained Vehicle parking area until Wednesday when we left, however, it won’t be too long before we are back at the end of the year to take up our Camp Host duties once again. We are now at Ardmore for a few days. Oh and for those of you who are interested, the mouse kill count was up to 90 by the time we left the main camp last Friday!